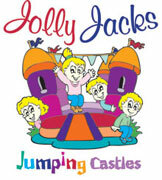 News | JOLLY JACKS JUMPING CASTLES! Jolly Jacks Jumping Castles goes live online, making it easier to book jumping castles in Melbourne, movie pop corn machine, fairy floss, & mixed lolly bar. JollyJacks-JumpingCastles.com.au is now live online, following 2 months of development. Jolly Jacks Jumping Castles will be updating their website on a regular basis, featuring special promotions, and any major news and events. The website also has the possibility to provide customer feedback and testimonials.